What better way to spice up the classic aglio olio pasta dish, than with some crispy pork belly? 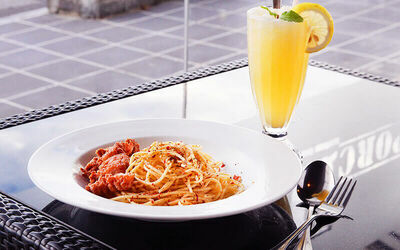 Head down to Porc 11 Ribs Cafe today and enjoy this enhanced pasta dish, sure to tantalise your taste buds. Pair it with a refreshing cup of hot or cold lemon drink and your meal is complete! Valid Wed – Mon: 12pm – 9pm. Not valid on public holidays / eve of public holidays.